Tyler Olson is an award-winning serial entrepreneur in several technology fields as well as the Founder of Modern Foundation, an analytics-first marketing social & search consultancy. He is also a keynote speaker and frequently speaks for organizations such as IBM, 3M, Target, and more. In this episode, Tyler shares his experience on what it takes to build an engaging and fun work environment for his team, what Millennials in the workforce crave from their leaders, and how he weeds out toxic and damaging individuals from entering his company culture. 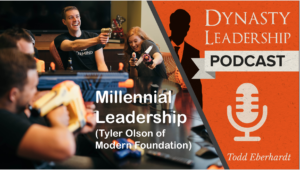 Listen in as Tyler re-defines expectations of millennial leadership and how we can all benefit from what he has learned along the way. [2:00] A quick introduction about Tyler. [2:55] Tyler is currently exploring the digital nomad lifestyle. [4:05] Who is Tyler and how did he get started as an entrepreneur? [8:10] How does Tyler recruit through inspiration? [13:50] What does Tyler mean by having a ‘bad cop’ filter? * What should you be looking for in your next millennial hire? [17:55] Tyler is honest with his employees. His company is not going to pay the highest salary, but they make up for that by having flexible hours and a healthy/fun work environment. [21:00] What kind of misconceptions do people have about Millennials? [24:20] How does Tyler define what a ‘life-long learner’ means? [28:00] Tyler shares his core values for his company. [35:20] A bad hire cost Tyler around $250,000. [37:55] How can business owners run a better, and happier, business for the younger workforce? Tyler and I first got the chance to meet each other while he was the emcee for Sarah Sladek on her talk about Millennial Leadership in the workplace at an event sponsored by Marsh & McLennan Agency. Special thanks to PK Kriha and Ryan Watkins of MMA for making this event a huge success. You can click here to see a video of both Tyler and Sarah’s presentation at the event.